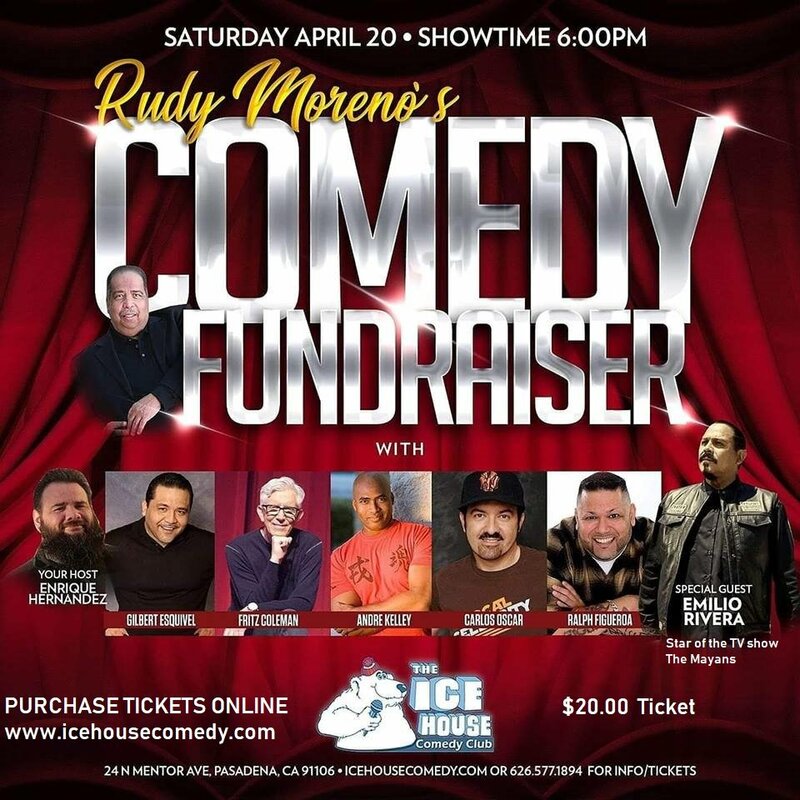 The Ice House :: Benefit for Rudy Moreno - with special guest Emilio Rivera from Netflix's Mayans, Gilbert Esquivel, Carlos Oscar and more! Benefit for Rudy Moreno - with special guest Emilio Rivera from Netflix's Mayans, Gilbert Esquivel, Carlos Oscar and more! With host ENRIQUE HERNANDEZ, GILBERT ESQUIVEL, FRITZ COLEMAN, CARLOS OSCAR, ANDRE KELLEY, RALPH FIGUEROA and Special guest EMILIO RIVERA form Netflix's Mayans! The son of migrant workers, Gilbert was born in Parma, Idaho. He spent his childhood moving from city to city, until his family settled in Pacoima, California. There, he became caught up in the world of gang violence. After years of “doing the wrong things,” Gilbert decided to redirect his life in a positive way. By finding humor in his gang experiences, he has taken his unique perspective on life to audiences around the country. Gilbert used to cross the country with his parents working in the fields. Now he travels the country doing jokes in comedy clubs, churches, prisons, colleges, The Apollo Theater and Caesars Palace in Las Vegas. Gilbert won his first comedy competition just one year into his stand-up career at the world famous Ice House in Pasadena, California. He has been seen on many television shows that include Que Locos and was one of the first Latino Semi-finalists on BET’s ComicView. Carlos Oscar is known for his charming, witty and energetic stage persona. He fully acts out his jokes by telling stories and morphing in various characters and voices. Carlos jokes most about the humorous side of his family, society, and everyday mishaps. His comedy appeals to the mass audience.